Click on the image above to see the map in all its gory detail. If we’re to take the lyrics of this rock icon at face value, then Toronto certainly has everything. Our urban lore is rife with tales of wraiths, poltergeists, hexes, demons, and just plain spooks. Queen’s Park is plagued by a host of harpies. The Ryerson Theatre School is haunted by a being of unspeakable horror. Even the Hockey Hall of Fame bears the mark of a gruesome past. 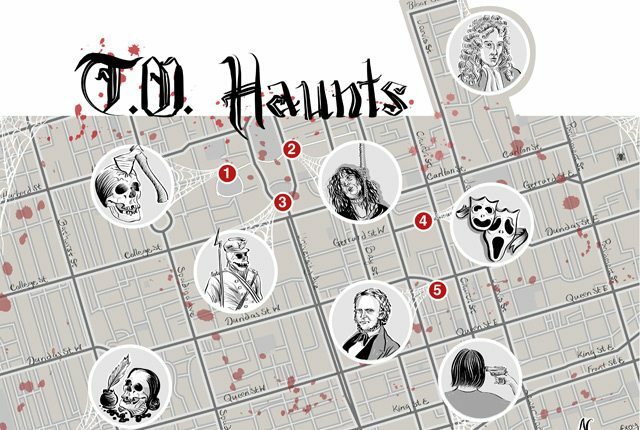 If this primer on local area cryptohistory gets you hankering for more ghoulish gossip, check out John Robert Colombo’s, Haunted Toronto, and the Toronto Ghosts and Hauntings Research Society’s comprehensive sightings database. Muddy York also offers walking tours of some of the city’s most prominent haunted landmarks. ON TO THE GHOST MAP!